Beautiful one bedroom apartment located in a brand new building in the heart of Palermo Hollywood. It has been recently decorated with a great taste. 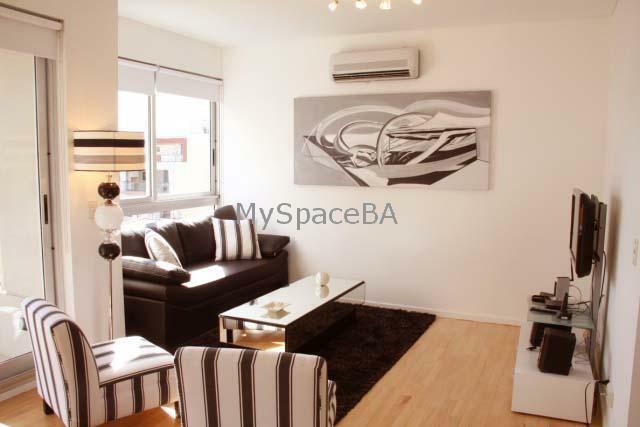 The apartment offers a nice living room , dinning area with a glass table and chairs . LCD TV . Aircon . Central heating . Balcony . Fully equipped kitchen . The bedroom is ample and has a Queen Size bed , closet and aircon . Complete bathroom with bath . Balcony. Wooden floors. Suitable to sleep 4 people, it has a double bed and two single sofa bed . Air conditioning in each room. Central heating. LCD TV. DVD. Wi Fi Internet. Music System . Vacuum cleaner. Iron. Hair-dryer. Safe Box . Freezer. Refrigerator . Microwave. Toaster . Coffee maker . Dishes . Brand New building. Security 24 hs. Elevators. Fitness Center. Sauna. Swimming pool for summer season. Laundry. Function room. Located in the heart of Palermo Hollywood, area well known for its famous restaurants and bars . Santa Avenue is very close with banks and its commercial area. A network of underground and bus stops. Palermo Soho at just a few metres.